It's a physiological fact that all organs and organ systems of the body require certain gradients of temperature, moisture, pressure and so on to be able to function. If the body were perfectly homogeneous, it would be inert and lifeless, like a statue. And so, in Greek Medicine, the various organs, tissues and parts of the body differ from each other in their basic qualities, or inherent temperament. These differences or gradients of temperament enable the body to function. Even a cursory examination of the various organs, tissues and body parts will reveal that they have certain inherent traits which enable them to perform their functions. The bones, for example, are stiff and hard because they're Cold and Dry, which enables them to support the weight of the body. The liver, on the other hand, is warm, soft and squishy, and a dark, blood red color because it has to generate the blood and all the humors. The balance or makeup of inherent traits and qualities that an organ, tissue or body part has, which enable it to perform its functions is called its inherent temperament. As with the organism as a whole, the health of an organ, tissue or body part is measured by how in balance or in tune it is with its inherent temperament. Deviations from its inherent temperament compromise a part's health, vitality and immunity and leave it vulnerable to dysfunction and disease. The Hot / Cold polarity refers to the relative level of heat and metabolic activity occurring in a body part. Parts with a Hot or Warm inherent temperament are either hot or warm to the touch or have a high level of metabolic activity. Parts with a Cold inherent temperament will either feel cool or cold to the touch or have a low level of metabolic activity. The Dry / Wet polarity refers to a part's relative moisture level. It also refers to a part's level of hardness or firmness versus softness, squishiness or laxness. Organs and parts that distill, extract, digest or refine need a certain dryness to be able to function. Organs and parts that mix, unite, dissolve, secrete, or generate things need a certain wetness to be able to function. Of all the body parts, Greek Medicine considers the skin to be the most inherently neutral and balanced in temperament. 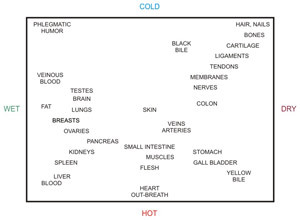 All the other organs, tissues and body parts are either Hotter or Colder, Wetter or Dryer than the skin. Hot - the exhalation or outbreath is the hottest, being obviously hot to the touch. The heart is considered to be the hottest internal organ, since it constantly beats, or pulsates. In heat, the heart is closely followed by the blood, which carries the Innate Heat. Close behind is the liver, a real hotbed of metabolic activity. Cold - The Phlegmatic humor, being the body's main coolant, is considered to be the coldest substance in the body. The hair comes next, since it consists of dead protein filaments, devoid of all metabolic activity. Next come the bones, with a very low level of metabolic activity, followed by the cartilage, which is softer, warmer, and more mechanically and metabolically active. Dry - Our Cold friends, the hair and bones, are also the dryest parts of the organism, being very hard and dense as well. The phrase "bone dry" is a common expression. The bones are followed by the cartilage, which is slightly smoother and softer, and therefore more moist. Next come the tendons and ligaments, which, as connective tissues, need a certain hardness, stiffness and durability to perform their functions. Wet - The coldest substance in the body, the Phlegmatic humor, is also the wettest, since it's the body's main lubricant. Slightly dryer, and therefore thicker and less dilute, but still quite wet, is blood, or the Sanguine humor. The liver is the wettest internal organ, because it has to generate the blood and the other humors. Also, the basic vulnerabilities of an organ or body part tell a lot about its inherent temperament. For example, the throat, which is constantly being bathed in the outbreath, is one of the warmest parts of the organism; therefore, it's very vulnerable to cold drafts and chills. The brain, besides being one of the wettest internal organs, is also one of the coldest; therefore, fevers and excessive heat, as well as dehydration, can seriously impair its functioning. Generally, a body part is most vulnerable to qualities that run counter to those it needs for optimal functioning. Besides having their own inherent compound temperaments, the Four Humors also perform an important homeostatic function for the organism. All the Four Humors, working harmoniously together, give considerable stability and balance to the inherent temperaments of the organs, tissues and body parts with which they come into contact. In other words, the Four Humors hold the qualities and temperaments in place. The humors with which a body part constantly comes into contact also exert a great influence on its inherent temperament. For example, the walls of the arteries are hotter than those of the viens because arterial blood is hotter than veinous blood, which has been depleted of its metabolic energy. In Greek Medicine, every part of the body, including the Four Humors themselves, is subject to conditions of being either in temperament or in dystemperament. For example, a Hot dystemperament of the blood would be a fever or inflammation affecting the blood. In the center is the skin. At the bottom is Hot, at the top Cold. At the left is Wet, at the right is Dry. The idea for such a chart is not my own. It comes from Graeme Tobyn's excellent book, Culpeper's Medicine. I have merely adapted it, adding a few extra organs, tissues and body parts. The above chart shows the inherent temperaments of the organs, tissues and body parts relative to each other; it is not absolute. The actual setpoints of normal inherent temperament can actually vary considerably in accordance with an individual's constitutional temperament. In someone of Choleric temperament, for example, all the actual setpoints would be hotter and dryer than in someone of a balanced, equable constitutional temperament. Often, the bodies of those of a certain constitutional temperament will emphasize parts having that temperament. For example, the bones, tendons and joints tend to be prominent in those of a Melancholic constitutional temperament because these parts are Cold and Dry.